Hurricane Irma Hits Cuba, Approaches Florida in NASA Satellite View. The colossal storm made landfall on the northern coast of Cuba Friday evening (Sept. 8) at a Category 5 hurricane, and since then the eye of the storm has been moving west-northwest along the coast at a speed of about 9 mph (15 km/h), the National Hurricane Center (NHC) reports. You can see the latest satellite videos of Hurricane Irma here. Irma was downgraded to a Category 3 hurricane at about 11 a.m. EDT (1500 GMT) on Saturday. However, officials warn that it is expected to regain strength once it moves back over warm ocean water later tonight. "Irma is forecast to restrengthen once it moves away from Cuba, and Irma is expected to remain a powerful hurricane as it approaches Florida," the NHC said in a public advisory. In a separate statement, NASA officials predicted that "the core of Irma will continue to move near or over the north coast of Cuba later today, and will reach the Florida Keys Sunday morning. 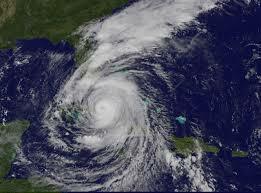 The hurricane is expected to move along or near the southwest coast of Florida Sunday afternoon." NASA's Kennedy Space Center in Cape Canaveral Florida, along the state's central eastern coast, closed yesterday in preparation for Irma's arrival. In a Twitter statement today, KSC officials said the center is entering a secure HURCON 1 condition as the storm approaches. Nearby, the U.S. military's Cape Canaveral Air Force Station had taken its own steps to safeguard the base and spaceport ahead of the storm. Weather satellites operated by NASA and the National Oceanic and Atmospheric Administration (NOAA) have been monitoring the storm from space since it formed out in the Atlantic Ocean this week. A recent view from NASA's Aqua satellite on Saturday morning revealed cold temperatures in the cloud tops of thunderstorms surrounding Hurricane Irma's core, as well as in a band of thunderstorms over the Florida Keys. This infrared image from the MODIS instrument aboard NASA's Aqua satellite shows extremely cold temperatures (red) in thunderstorms surrounding the eye of Hurricane Irma as it traveled along Cuba's northern coast on Sept. 9 at 3:15 a.m. EDT (0715) GMT).